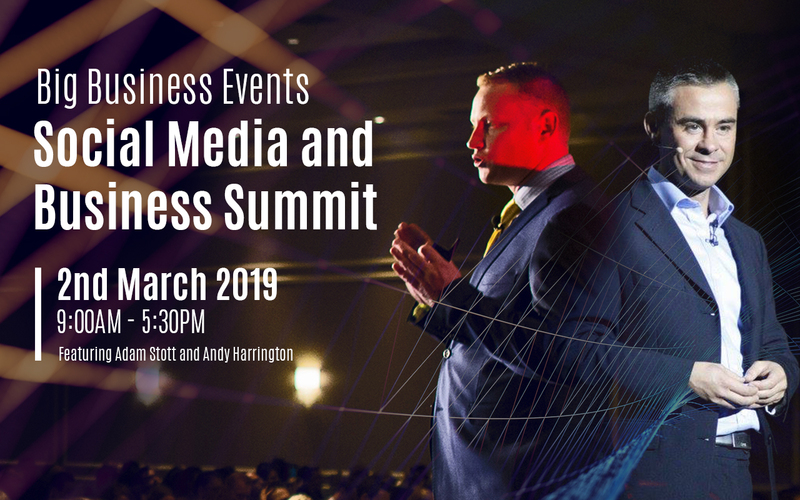 Two of the UK’s foremost social media and business speakers will be on stage together for the first time on 2nd March. Adam Stott (Big Business Events Founder, International Speaker, and Business Coach) and Andy Harrington (International Speaker and Business Coach) will be sharing the skills, strategies, and secrets they used to generate millions in revenue for multiple businesses. Adam started his first business as a young man from his mums’ house and over the next 9 years he grew the business to a turnover of more than £25m and was included in the Financial Times Top 100 Businesses to Inspire Britain for three years in a row. During this time Adam pioneered lead generation in social media and sold more than £50m of product and services. At age 29 Andy Harrington was working in a call center for an insurance company making just £1500 per month. Andy knew he was destined for something bigger so he £10,000 from the bank and started a business that has now pulled in more than £50m revenue. Andy’s passion is in raising peoples earning potential by breaking them out of the limited mindset of how much they think they are worth. His Power to Achieve Weekend Seminar has helped improve the quality of lives of thousands of successful people around the world and is a must attend for anyone serious about realising their potential. Join Adam, Andy and hundreds of other forward-thinking business owners on 2nd March for a truly life-changing day full of high-quality top-level content designed to help your business create more brand awareness, generate more leads, have more meaningful conversations with your desired customers, increase your profits and instill you with the success mindset that all top CEO’s possess. Opportunities to attend events like this don’t come around very often and space is limited. Make sure you don’t miss out – use the form below to reserve a seat. You can reserve more than one seat (and we encourage you to do so quickly) so if you would like to attend with a business partner or colleague please feel free while we have space. Register below for the Social Media and Business Summit! By reserving your seat, you give Big Business Events permission to send you follow up emails regarding this and future events. You can opt out at anytime.